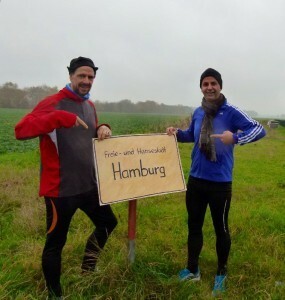 Our colleagues in Hanover, Germany are excellent runners, as they prove at many local events. But they are also crazy about soccer. Our airline customers and partners got to know all about our colleagues’ sporting passions at an event that was organized to present our Regional Production Center in Hanover (which also delivers products to airports in Hamburg, Bremen, Paderborn-Lippstadt, Münster-Osnabrück and Dortmund). Timo Mücke, Managing Director Hanover, and Max von Löwis, Controller, presented a homemade foosball table to the astonished audience – and as we’re in the airline industry, the foosball table was of course on top of a trolley! With everyone still infected by world cup soccer fever they offered the trolley up for auction. To add to the auction atmosphere they agreed, that if the bid went over their target price, they would run 162 kilometers within a week – the distance that our trucks cover every day between Hanover and Hamburg. It never really came to an auction as a colleague from the airport was so impressed by the table, he offered the requested amount at once. The audience was fascinated, the foosball table owner happy and Timo Mücke and Max von Löwis thought about getting their running shoes on. As promised, the two started their run on November 10 – cheered on by colleagues. Within a week the two covered the whole distance – each running 81 kilometers. But there was only one real winner – the Sport Foundation run by the Neue Presse Hannover newspaper, who the money from the auction was donated to.